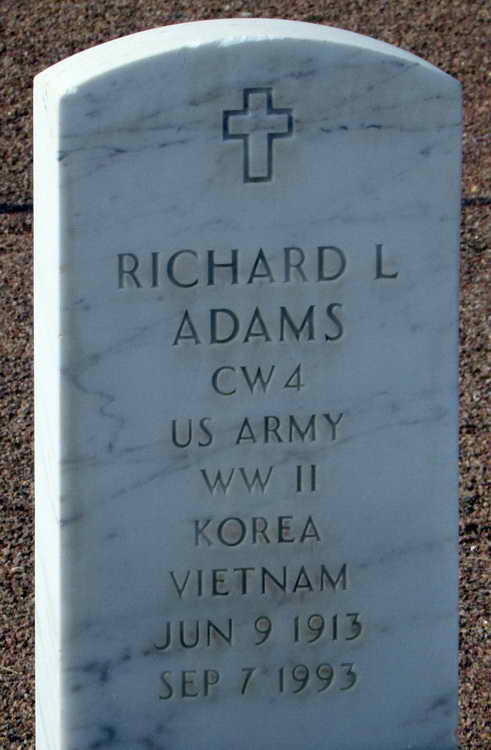 Grave marker for Richard L. Adams in Plot:L, Grave 1625, Fort Bliss National Cemetery, El Paso (El Paso county), Texas. Pvt Adams was transferred from the 11th Replacement Depot to Hq 2nd, 508th PIR on 10 August 1944. He was promoted to Pfc on 26 January 1945. On 13 November 1945, T5 Adams received an Honorable Discharge and re-enlisted in the Regular Army for a period of 18 months. He made a career of the Army, saw service during the Korean Conflict and Vietnam War, retiring as a Chief Warrant Officer (CW-4).